Yup, it's a real gun. A real badass gun. This is The Vampire Hunter's Colt Detective Special, a .38 Special six-shot revolver. The whole thing is silver plated--even inside the chambers--and it comes with silver bullets. 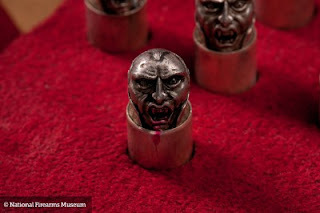 The bullets are carved, not with a cross, but with a vampire head. A crucifix engraving can be found on the muzzle, a which is meant to give the shooter a tactical advantage at close range. The entire gun is engraved, in fact. 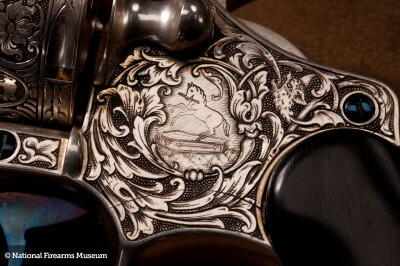 Intricate and delicate carvings that include a re-design of the Colt logo in which the horse is dancing on an coffin. Embedded in the grip are two sterling silver bats, denoting two successful kills. Note, there's ample room for additional bats. 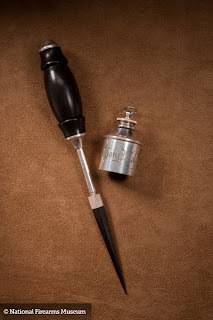 The kit comes complete with a cleaning rod that serves double-duty as a wooden stake, a vial of holy water, and a mirror. This gun is not for sale. 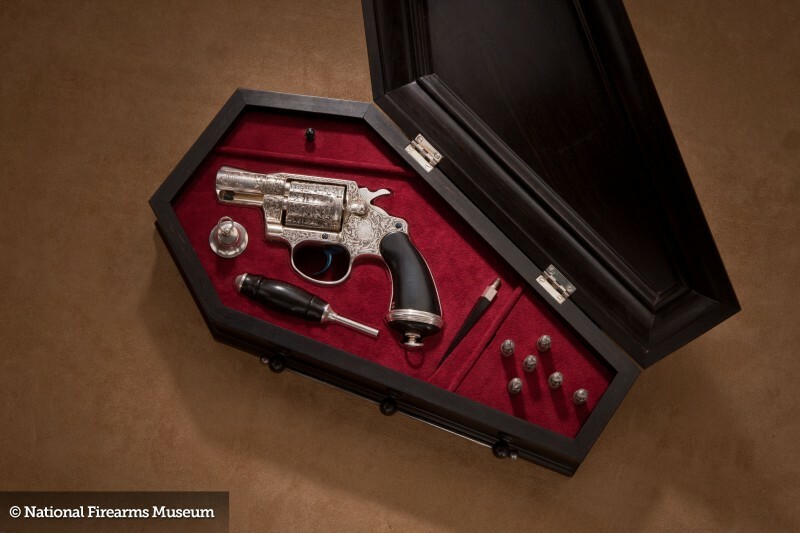 It's a museum piece, part of the Robert E. Peterson Gallery at the National Firearms Museum. Even if you're not a gun person, you can't help but appreciate the craftsmanship on display here. It's a step up (way up) from the zombie hunting paraphernalia on the market these days. Would shooting a normal person w/ vampire-head bullets cause that person to become a vampire?